Summer is a relaxed time at our home. We try to hang out at the pool a LOT, spend time in our backyard, and visit fun places around town. We also try to make time for reading. According to the National Summer Learning Association , children lose an average of 2 months of knowledge during the summer vacation. If you multiply that by 6 years of Elementary School, that equates to at least 12 months of learning loss. Before we get too fixated on the numbers, however, it should be noted that the majority of the studies supporting this idea were conducted on low income families or on families who had less access to reading materials. In fact, the research shows that children in middle income families actually make slight GAINS over the summer. What the difference? I think one difference could be access and exposure to books and "life experiences". One study showed that by simply providing books to students who normally wouldn't have access to books, students retained as much knowledge as if they had gone to summer school. In order to go a little deeper with our summer reading this year, I'm trying out the Five in a Row Curriculum. The local library actually has all of the volumes of Five in a Row. I'll be sharing our favorite picks from Five in a Row here at Ready-Set-Read this summer. I'll also be sharing a picture book of the day every day on my facebook page. These are book recommendations I have made as well as recommendations from other book bloggers. Today I am sharing, The Giraffe the Walked to Paris. 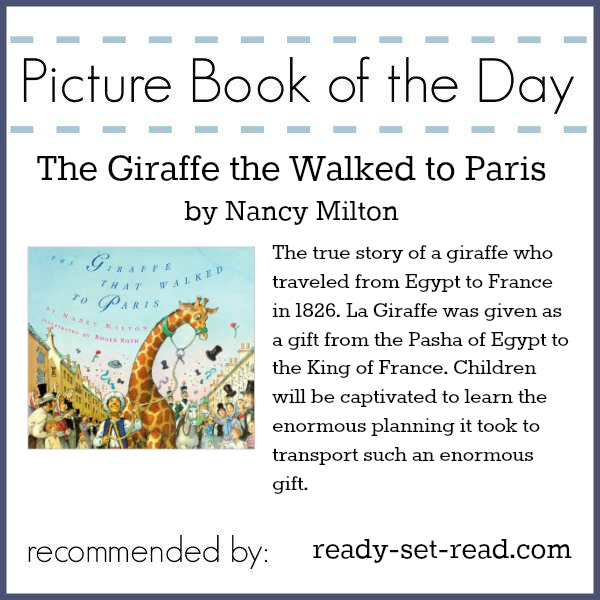 The Giraffe the Walked to Paris by Nancy Milton is the true story of a giraffe that was given as a gift from the Pasha of Egypt to the King of France. In 1826, the ruler of Egypt decided to give a gift to the King of France to appease him after a disagreement. There were no giraffes in France at the time, so the decision was made to send a giraffe to France. The book details the travels of La Giraffe and the reactions of the French people and the King. It is a well written, well illustrated story that kids will love to read over and over again! The Five in a Row book has wonderful suggestions for orienting your child to the book. For my boys (ages 4 and 6), we took a picture walk. We looked at the images of Egypt and talked about the landscape, weather, dress of the people. We also talked about the names of the characters in this book as their names sound different to my boys. Then we flipped to the pages that featured France. We talked again about the landscape, the dress of the people, and the potential time period. I also gave the boys a brief introduction to the plot. My goal for my little learners was to understand how tall a giraffe might be, compare heights, and use non standard measurements. 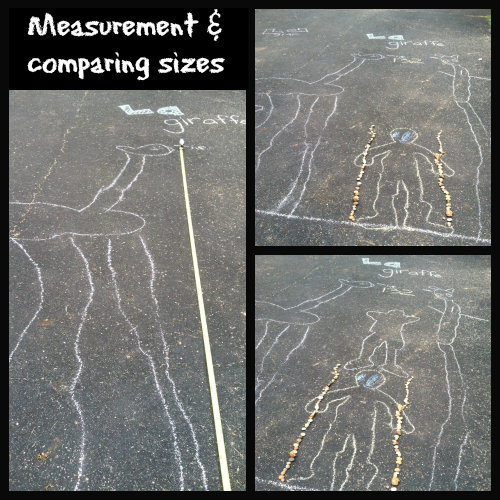 We went outside to our driveway and measured 11 feet, the height of La Giraffe. Then we measured our own heights and compared. We used rocks to measure and compare as well. Then Logan wondered, "If I stand on Tyson's head would I be the height of La Giraffe?" So, we drew it out on the driveway to find out. When we came inside the boys were still interested in measuring. They used blocks to measure each other and compare heights. In the story, the king of France is getting very impatient to receive his gift of a giraffe. He has never seen a real giraffe and can't hardly wait. One of his researchers is tasked with drawing a picture of a giraffe for the King. Of course, the researcher has never seen a real giraffe either. However, his picture is fairly close. I found this fun activity to try drawing a pangolin, an animal with which my boys would not have familiarity. I had to wikipedia pangolin and go off of their description. 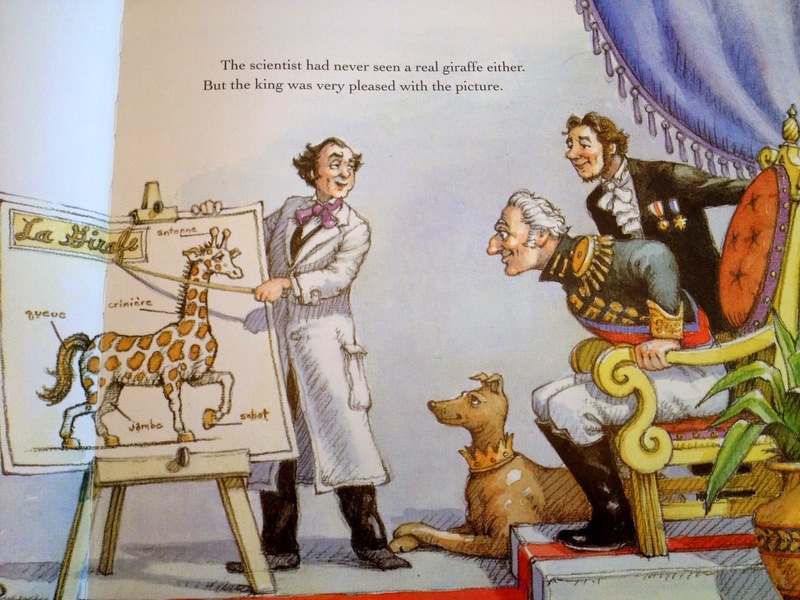 In the story, King Charles is surprised by how the giraffe walks. He compares the way La Giraffe walks to how his horses walk. 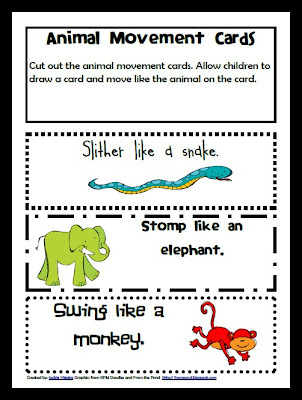 We used the animal movement cards from my free zoo unit to explore how a variety of animals move. Printable Early Reader Book "At the Zoo"
In The Giraffe that Walked to Paris, the Pasha of Egypt and his men must transport La Giraffe from Egypt to Southern France. This requires her to travel across the Mediterranean sea. They use a boat with sails powered by wind to travel. The boys were interested in exploring boats and wind power. We made these fun sailboats used our wind power to blow them across our water table. We also experimented with floating. We used foil to create a boat and tried to see how many people could float in one boat. It was pretty amazing to the boys that the boat that carried La Giraffe held people, a giraffe, cows, and an antelope! This was a great longer picture book and Five in a Row was super helpful in suggestions for book activities. I'm enjoying exploring longer picture books with the boys at this age and reading closely on each of our rereadings. I'd recommend this for an educational and engaging summer read.